BHC Alhambra Hospital – Conversion Page Development | ASTRALCOM - Content Strategy, Conversion Marketing and Customer Acquisition. BHC Alhambra Hospital – Conversion Page Development | ASTRALCOM – Content Strategy, Conversion Marketing and Customer Acquisition. BHC Alhambra Hospital was interested in creating a way to connect with and then engage patients looking for assistance with an eating disorder. We felt that once we targeted the proper audience, we’d need to somehow engage them and start the relationship process. We determined that an online eating disorder survey would be the best tactic. We worked closely with the medical professional staff to develop a custom eating disorder survey. Each survey was scored for symptom severity and the results emailed to the survey respondent. 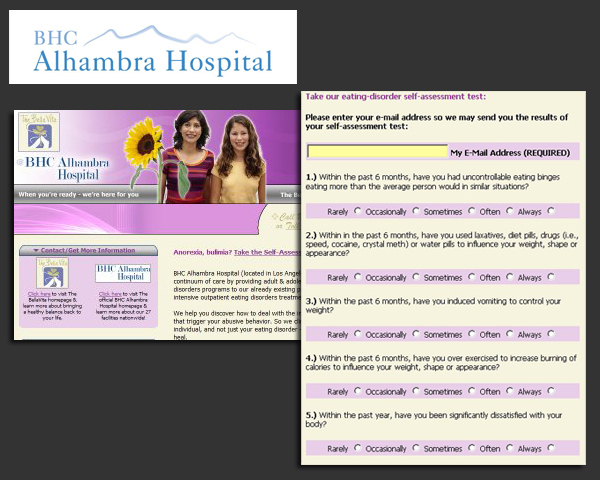 By creating an eating disorders survey for BHC Alhambra Hospital, we were able to help them connect with patients seeking information about and help with their condition. That digital relationship, or customer experience, is the key to creating measurable outcomes (phone call, download, contact request, etc) with content. Creating engaging experiences with content is our specialty. Reach out to us today and we’ll come to your aid.